Hole 1: The opening hole of your round starts with a 359 yard par 4. The fairway is narrow with a large tree on the right side at about 165 yards. A well placed tee shot of 200 yards leaves you a middle iron away from the green. But, watch for the water that is 40 yards short of the green. Hole 2: If you can keep your tee shot straight on the 329 yard par 4 second, you will get through the trees to an open fairway. 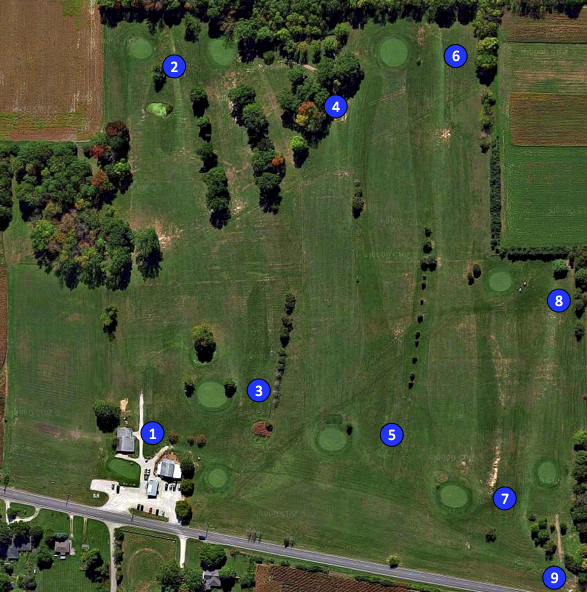 But, be careful of your placement, fade to the left and you have a large tree to contend with to get to the green. Place your tee shot of 230 yards slightly right and you have a clear 100 yards to the green. Hole 3: The closer you get to the green on the 319 yard hole number 3, the more narrow it becomes. An accurate tee shot between 200 and 250 yards will leave an easy iron into this adulating green. Hole 4: An enclosed tee box for the first 100 yards on hole number 4 opens up to a wide fairway. Don't let your tee shot on this 345 yard hole fade right and you should have an open second shot into this green. Hole 5: For this uphill 363 yard hole, let your drive go as there isn't much trouble other than a few pine trees down the left and right side. With a drive of 250+ yards, the trees are out of play. A carefully placed second shot on this large green will give you a great birdie chance. Hole 6: The only par 5 at PGC, gives you an opportunity for red numbers. The fairway on this 470 yard hole, tightens up at 200 yards down the fairway, but an accurate tee shot allows you to take advantage of a slight hill, earning you extra yardage. Go for it in two with a long iron or wood, and the eagle could be within your reach, but watch the hole as it starts to go back uphill. Hole 7: The first of back-to-back par 3's leaves you with a long and deceiving tee shot, 210 yards. Top that with a tough green highlighted with an extreme slope left to right, and you are lucky to move on with a par. Hole 8: The second par 3, at 180 yards, will get you back on track. Keep an accurate tee shot straight, with a soft landing on the green and you have put yourself in position for a birdie. Hole 9: The finishing hole is a 330 yard downhill par 4. A straight and long tee shot of 250+ yards allows for a more accurate second shot to small closing green. Be careful with your placement and you have an opportunity to close out with a birdie.